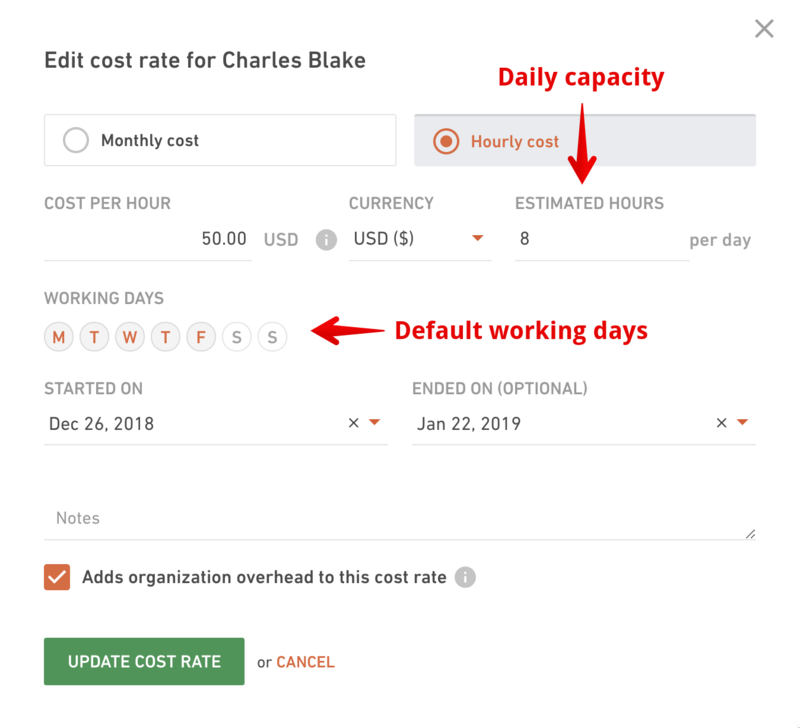 Wondering how capacity works in Productive? This article will tell you everything you need to know. When looking at capacity for a single person, this is the total number of hours they could potentially work within a time period. We will use one month as an example throughout the article. The cost rate directly affects the capacity of a person. When setting it up, you get to choose the default working days and the daily capacity in hours for each employee. In the example below, Charles Blake should work Monday through Friday, 8 hours per day. If there are 20 working days in a month, this leaves Charles Blake with the monthly capacity of 160 hours. 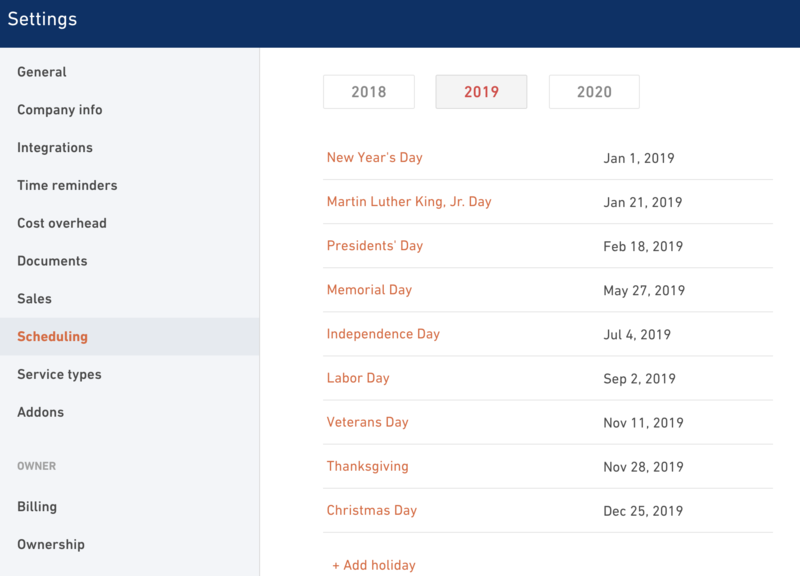 You can find the list of national holidays in Settings > Scheduling. We will automatically pull in national holidays for your country based on the locale of your Productive account. All of these holidays are non-working days. Depending on how many holidays there are in a month, the capacity will be reduced accordingly. For example, there are two holidays in January 2019, which will reduce Charles Blake's total monthly capacity by 16 hours (8 hours per day). So, Charles Blake's capacity is the total number of working hours in a month, excluding weekends and holidays (non-working days). However, this does not necessarily mean that Charles Blake will be available to work 100% of his remaining monthly capacity. The other metric we need to consider here is his availability. In an ideal case, where there are no additional events in a month, Charles's situation in Reports > Time report for that particular month will look like this. However, this situation will change as soon as we add some events to the schedule. We will now simulate Charles going on vacation for 5 days. This is what his vacation looks like in the schedule. As soon as we do this, you will notice a change in the time report. The capacity will remain the same, but the availability will reduce by 40 hours, becoming 120 instead of 160. The most important thing to remember is that all of the utilization metrics are calculated using availability, rather than capacity. This is more accurate because availability represents the actual number of hours somebody has spent working, regardless of their capacity in a certain time period. It's important to understand that events can be either Paid or Unpaid. Take a look at the image below. This is an example where we have set up a Vacation event which can be either Paid or Unpaid. There's a big difference which you need to be mindful of. Let's use the example of Charles Blake going on vacation for 5 days.